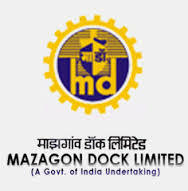 MAZAGON DOCK Limited MDL published the official recruitment notification Advertisement Ref. No. : MDL/HR-CR/REC/56/2017 for inviting application form for various categories of the posts. MDSL Mazagon Dock Shipbuilders Limited will fill posts of manager, executive trainee and senior manager category. Selection of the eligible candidates will be done through written examination. All interested candidates who hold the eligibility criteria they can fill application form in prescribe application form format. Last date of application form submission is 27 july. Total no of vacancies are 30 including various categories. Important recruitment details as are following. Eligibility Criteria as on 27 July 2017: please refer official Notification for Complete details of eligibility Criteria and education qualified details. Application form fee: rs 340 for general and OBC candidates.